Think about the hassle you go through to hook up multiple HDMI devices just to your television. Now, just imagine how hard it would be to do the same in a sports bar or cinema, or even a stadium, with multiple big screens and a variety of video sources at varying distances from each other. The professional multi-billion-dollar video industry (Pro AV) is working to solve these content distribution challenges through networking. With the migration over to 4K video content, Pro AV has approached an even more challenging hurdle to overcome. Installers used to convert video to a proprietary network standard (HDBase-T) in order to transport signals over longer distances with multiple sources and screens. It could be compared to the analog telephone switchboards of old. But this solution just will not work when making the move over to 4K video. Thus, matrix switching and HDBase-T have essentially become obsolete. There is also an overwhelming demand to streamline audio-visual network designs in order to make AV systems more simple to manage. So how do we go about solving for this? Introducing the Software Defined Video over Ethernet Alliance (SDVoE), which is an ecosystem of companies in and around the AV-over-IP space, working together to create a platform for the next generation of audio-visual applications. Many Pro AV applications demand zero latency and flawless image quality, but the old 1 Gbps AV-over-IP products cannot deliver on these requirements. Latency is too high and visual artifacts too common. As a proud founding member of the SDVoE Alliance, NETGEAR has designed the M4300 switch for true AV-over-IP, enabling worry free integration and Zero-Touch install of SDVoE systems. NETGEAR commits to the SDVoE standard with these M4300 switches that are pre-configured for AV and Multicast Zero-Touch Network Configuration. For the technical readers of this blog: IGMP Snooping is already enabled in default VLAN 1, IGMP Fast Leave is enabled and the IGMP Querier mode is also enabled. You don’t need to log on to the switch. 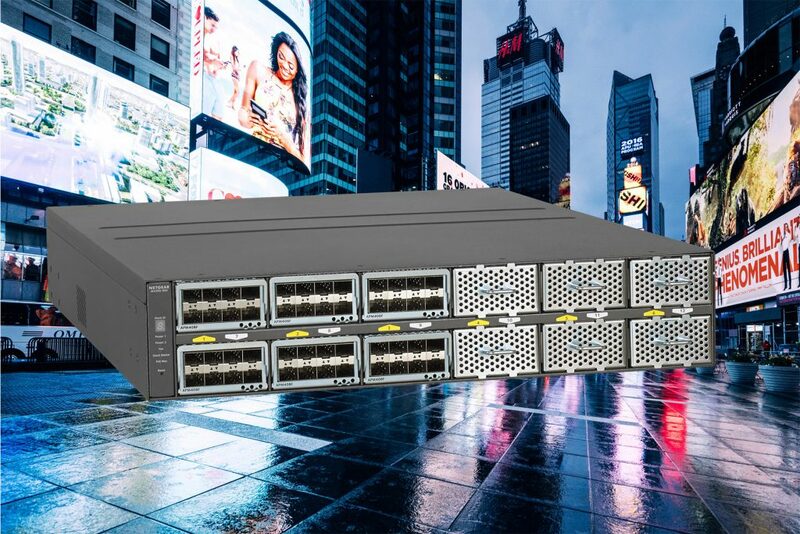 Now with a 96- port model, just select the port expansion cards that fit your requirements (number of copper ports, number of fiber ports, number of PoE+ ports), connect your SDVoE devices, power on your switch, and get to streaming content. The SDVoE Alliance members provide the platform that is necessary to enable AV/IT convergence by using 10G Ethernet hardware to move video with flawless quality and zero latency.